Cartier have announced the arrival of their new Cartier Rotonde de Cartier Grande Complication watch on social media with the tagline “Never Rush Perfection”, but really, what they have achieved after just five years of development has been anything but tardy. Comprising of 576 components the piece features a trio of complications; a perpetual calendar, a minute repeater and a flying tourbillon. Better still, the mechanical workings of all three are visible offering a full and compelling panorama. At every step in the development of this extraordinary watch the micro components and their arrangement have been re-designed so that everything fits neatly into a calibre which, at just 5.49mm high has an astoundingly svelte profile. A fine example of a showcase piece, the Cartier Rotonde de Cartier Grande Complication watch lays bare its technical achievements and its fastidious hand-finishing through an 18-carat gold openworked dial and a skillfully crafted skeletonised movement. Dial-side, the perpetual calendar indications are laid out with equipoise. Its marvellous mechanical memory takes into account the variation of days in each month and those in a leap year, and it has even been engineered to overcome the quirks of the Gregorian calendar, and will only need adjustment once every 100 years. The transparency of the dial allows for a full view of the gongs and hammers of the minute repeater offering a compelling spectacle. Attention to detail in the construction of its components ensures pure harmonics, and on the technical side it has been designed to be fool-proof, ensuring that partial activation of the minute repeater mechanism is not possible. At 12 o’clock, the tourbillon “flies” within its delicate little titanium cage adding an energetic focal point. 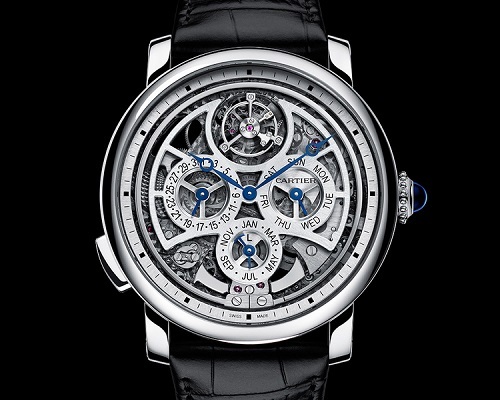 Around the back, the skeletonised self-winding Cartier calibre 9406 MC is revealed through a sapphire caseback and is a sight to behold. With its Poinçon de Genève standard of fine finishing and masterful skeletonisation work, the craftsmanship is quite simply a stunning display of the prowess of Cartier’s fine watchmaking development team under the watchful eye of Carole Forestier-Kasapi. The Cartier Rotonde de Cartier Grande Complication watch features a 45mm platinum case and comes presented on a black alligator strap.